I read this article and found it very interesting, thought it might be something for you. 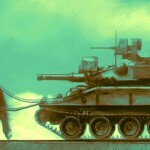 The article is called How 10,000 Years of War Made Humans the Greatest Cooperators on Earth and is located at http://evonomics.com/how-10000-years-of-war-made-humans-the-greatest-cooperators/. Professor Turchin’s new book Ultrasociety identifies the causal mechanisms hidden in the twists and turns of human civilization by quantifying the rise and fall of empires. The book translates some of Turchin’s academic work on cliodynamics, making it accessible to the interested lay reader. What is cliodynamics? My best translation is that it is the scientific study of history that seeks to use quantification to test, eliminate and open new competing hypotheses about the evolution of human civilization. Turchin draws the reader in with a puzzle. What social and psychological mechanisms give people the ability to contribute towards such enormous cooperative endeavours, like building the international space station? Turchin estimates that the total quantity of hours of human work and toil dedicated by the global workforce involved in the mammoth cooperative task of building the space station is around three-million people-years, or over 26 billion work hours. The obvious next question is how this compares with the other great cooperative feats of history, like the 400,000 people-years required to build the Great Pyramid of Giza, or the 100,000 people years to build the Coliseum in Rome, and whether these long run patterns signal an increase in humanity’s ability to cooperate at a vast scale. As an economist my bias is to see human actions in terms of self-interest, competition and conflict, where through the invisible hand the interaction of self-interested individuals can lead to productive outcomes. But like the fish who is blind to the vast ocean of water they live in, I realised I was blind to the ocean of cooperation that was the back-drop to my focus on self-interest and competition. In “Ultrasociety” Turchin provides a way to see and measure cooperation – to quantify its existence on a massive scale. Once you are able to see the great ocean of cooperation that dominates human society, it leads you to interesting and challenging lines of scientific inquiry. The puzzling question is then how a world dominated by ultra social human cooperation can also frequently succumb to large scale war and conflict? Turchin’s answer, and one of the big ideas in the book, is that war between social groups is the mechanism by which cooperative behaviour develops “within groups”. It is a fundamental evolutionary process happening between societies at a large scale. He elevates war as a selection mechanism for cooperation, and values it above many of the technological factors like domestication of plants and the advent of agriculture. Turchin debunks many standard stories that “explain” the path to civilisation and eliminates glaring inconsistencies in the archaeological record. The naive view that the invention of agriculture “…set the ball rolling, and the entire history of civilisation followed from that” is a satisfying common story. But it seems a stretch to claim that the small scale practice of seasonally collecting and planting seeds nearby small permanent settlements, leads directly to the large-scale institutions observed in ancient civilisations . 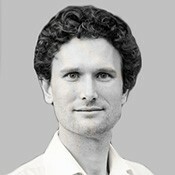 The “agricultural snowball” story is also hampered by the fact that early agricultural societies had “a markedly negative effect on human health” as the poorer nutrition compared to hunter gatherers lead to smaller stature, higher sickness and the spread of pathogens through the high density settlements. Yet agriculture did spread and ultimately outcompeted nomadic hunter-gather societies. I have long been hesitant about “just so” explanations of social institutions based on historic physical and technological conditions that turn simple correlations into plausible causal mechanisms. Turchin provides the evidence that although all early large scale civilisations had agriculture, it was not the agriculture alone that directly caused large scale civilisation. I felt foolish to have not recognised the array of “just so” stories in the study of history before Turchin pointed them out. In my field of economics, the existence of money is still explained in the textbooks as arising automatically once someone in human prehistory realised that some kind of currency made commerce easier than trying to directly trade a quarter of a cow for three baskets of vegetables. Yet many alternative social arrangements also solve the physical problem of a “double coincidence of wants”. We need look no further than current tribal societies that do not have or desire money despite their specialisation into many roles. They have instead resolved their double coincidence of wants dilemma through various other rituals, hierarchies, and institutions. Turchin, through his cliodynamics research agenda, aims to rid the historical study of civilisation from these “just so” explanations. In the aim of scientific progress this research agenda uses quantifiable historical data to pit multi-level selection theory and its various components against many others, and in doing so eliminate bad theories and open up new avenues of inquiry. Most chapters of the books contain references to this emerging field of research which themselves are intriguing and enlightening. Turchin argues that human societies, tribes, and groups, did not simply take a linear path from small hunter-gatherers tribes to large-scale civilisations. It was the competition through conquest and war between societies that lead to those with more effective weaponry and military organisations arising from greater internal cooperation, to survive at the expense of others. Here’s how I think these peaceful, stable societies came about. As war created large states, empires, and nation-states, societies evolved measures to suppress internal conflict and violence. Reduced internal violence is the obverse of increased cooperation. Surprising as it may seem, the trend towards greater peace was already noticeable during the Ancient and Medieval historical eras, long before the Enlightenment of the 18th century. Of course, wars between empires dwarfed intertribal conflicts in scale. Huge armies fought increasingly bloody battles, and the numbers of casualties mounted. But the key point is that these wars moved away from imperial centers, towards the frontiers. More and more people—those living far from frontiers where battles were fought—never experienced conflict, and could enjoy relative prosperity. There is no contradiction between larger armies and larger butcher’s bills from warfare, on the one hand, and on the other, a greater part of the population enjoying peace. What is important from the point of view of quality of life is not how many people, in total, are killed, but what the chances are that I (or you, or someone you care about) will be killed. In other words, the important statistic is the risk of violent death for each person. The power of this view is in the way the apparent contradiction of how war leads to peace becomes obvious once understood through an evolutionary lens. It changed my mental model of history from a series of inevitable linear events, to one of a branching tree of evolutionary paths, complete with many dead-ends of failed civilisations and their cultures, with many more merging and growing from conquest. In short, I have shifted away from the popular but incorrect view of evolution as linear and subject only to environmental stresses rather than intra-species conflict. The left panel of the below image epitomises this popular confusion that I ignorantly held in the context of the study of history. A more correct view of biological evolution is in the right panel, complete with mixing of genes and extinctions. It is more subtle and complex view, but provides a more useful story of the path of history, the dying out of civilisations and merging of cultures as a result of inter-group warfare. Here’s how war serves to weed out societies that “go bad.” When discipline, imposed by the need to survive conflict, gets relaxed, societies lose their ability to cooperate. A reactionary catchphrase of the 1970s used to go, “what this generation needs is a war,” a deplorable sentiment but one that in terms of cultural evolution might sometimes have a germ of cold logic. At any rate, there is a pattern that we see recurring throughout history, when a successful empire expands its borders so far that it becomes the biggest kid on the block. When survival is no longer at stake, selfish elites and other special interest groups capture the political agenda. The spirit that “we are all in the same boat” disappears and is replaced by a “winner take all” mentality. As the elites enrich themselves, the rest of the population is increasingly impoverished. Rampant inequality of wealth further corrodes cooperation. Beyond a certain point a formerly great empire becomes so dysfunctional that smaller, more cohesive neighbors begin tearing it apart. Eventually the capacity for cooperation declines to such a low level that barbarians can strike at the very heart of the empire without encountering significant resistance. But barbarians at the gate are not the real cause of imperial collapse. They are a consequence of the failure to sustain social cooperation. As the British historian Arnold Toynbee said, great civilisations are not murdered – they die by suicide. I have explored this process of disintegration of groups into competing clans in small scale in experiments before. Yet I failed to see the link to the large scale selection processes occurring even at such large scales at the nation-state. The talk of sclerosis and the death of large scale cooperation made me recall the chart below on the growth of partisan policy in the US which shows the striking decline in cross-party cooperation on legislative changes. Each node in the visual is a member of the U.S. House of Representatives from 1949–2012 , with Republicans in red and Democrats in blue. 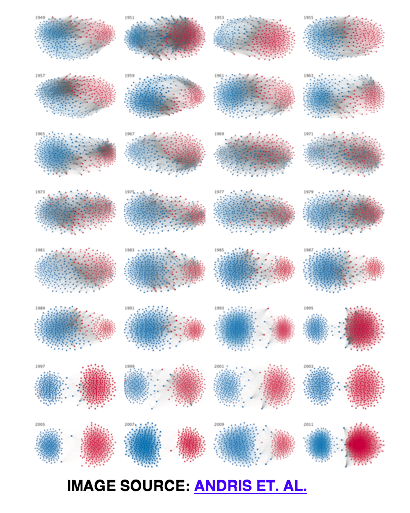 Edges are drawn between members who agree on legislative decisions more often than expected by chance, and the nodes are spaced out in a way so that those with more edges connecting them are closer together. The clustering therefore visualises who is cooperating with who in terms of developing legislation. Without the external threats to the nation as a whole after WWII, and later the Cold War the ability to maintain a cohesive national whole in political terms appears to have broken down into partisan scrambling. No long can we see a cooperative whole, but instead competing arbitrary tribes of blues and reds. I was left in a state of deep reflection after reading the book. Many other big ideas are woven through it to make you reconsider the popular but overly simplistic stories we tell ourselves to explain historical events. From the long term Z-shaped arc of quantifiable violence in human civilisation, to the role of horses, long range weaponry and population size in the success of inter-group warfare, and finally to the rise of God-kings and oppressive hierarchies. Even Turchin’s incidental detours explore rather significant questions, such as in Chapter 4 when he clarifies a point about culture in human societies with the off-handed comment “Incidentally, why do we have culture?” The same lesson applies in economics. Firms in highly competitive markets constantly face threats to their existence, leading to a type of destructive creation that ensures that surviving firms are internally highly cohesive and cooperative; economically efficient. Yet the process of competition is highly inefficient in economic terms as only very slightly different production facilities are duplicated by competitors. For me the trade-off is rather radical just to think about. That the gains to internal cohesion require a cost of an external threat or else large-scale groups will be undermined by the interests of sub-groups within them. Like any books that cover grand ideas about human civilisation there are probably some finer details to squabble about. I certainly don’t have the expertise to do so. Instead I want to share some of the thoughts that occupied my mind after reading Ultrasociety. These thoughts and comments should sufficiently signal the compelling nature of the discussions and ideas of the book. First, if sustained group cooperation relies on external competition, is there value in creating fictitious interstellar enemies to sustain better global cooperation? I’m thinking here of the film The Village, where the elders invented an outside enemy to sustain internal peace. The idea of creating an enemy for solidarity is popular, and even gets a run in the economics comics. Or perhaps the major modern religions fulfil this type of role so well that they can’t be displaced? And surely it is the moral thing to do to promote human cooperation on an even larger scale without actual conflict and violence, if that indeed is possible. Second, and following directly on from the first, the use of the term morality is widely used with its common meaning as conforming to the cooperative norms of a group. Yet I can’t shake the nagging feeling that, like Darwin’s work on evolution, the idea that war with outsiders promotes peace is ripe to be corrupted for political gain because it can be so easily argued to be a ‘natural’ or ‘moral’ position. Third, how are these great feats of cooperation realised in practice? Is there a common recipe that can be adopted into 21st public policy? There is a brief mention of how tribes and groups ‘tag’ each other with signals of group membership as one way to create cooperation in the following passage from Chapter 10. An important evolutionary breakthrough was the capacity to tag cooperating groups with symbolic markers such as language and dialect, styles of clothing and ornamentation (including tattoos), and behavioral characteristics—for example, participation in collective rituals. Symbolically-tagged cooperative groups, or tribes and nations, allowed us to increase the scale of cooperation beyond the circle of people personally known to us. Of course, the downside of increasing cooperation within a tribe or a nation was greater intensity of conflict with other tribes and nations. But like many of the minor points in the book, this single paragraph opens, then closes, a massively interesting puzzle about how humans actually organise into tribes at all levels. While as outsiders we easily observe tags, or the signals and rituals of a cultural group, as insiders we often overlook the amount of resources devoted to these tagging rituals. The whole fashion industry is almost exclusively about signalling social status, religious, sporting, or gender loyalties. People don’t buy cars just for transport; otherwise there would be little demand for more than a few different models. Instead we buy into marketing messages about how purchasing different types of cars tag us with different traits in the minds of others. At a national sale with have flags, anthems, national colours, sports teams and more that promote a sense of belonging. While I’ve always considered much of our conspicuous consumption to be wasteful, in the same way that the devotion of military resources often appears wasteful on the surface, a picture is emerging of the amazing gains from these types of tagging behaviours and rituals in terms of promoting high levels of cooperation. While not the direct focus of the book, I think more details on this part of the evolutionary view of cooperation and conflict would have been valuable. Fourth, what role does the massive advance in long-range weaponry since the dawn of the nuclear age mean for inter-group warfare? Turchin explains vividly how technology that allows for killing enemy combatants from a distance was a recipe for success in most warfare; starting with our evolved physical ability to accurately throwing rocks and spears, to the invention of bows and arrows, to the use of horses to mobilise armies over great distances. In the age of intercontinental missiles, drones, and nuclear weapons, how does the function of long-range of weaponry play out when the whole world can be anyone’s target? Fifth, if the cooperative effort required to wage large scale war is a major part of the causal story of the history of civilisation, how significant is the legacy of previous wars in the current economic landscape? I have in mind the major industries of modern society, such as passenger airlines arising from industrial investment in aerial warfare, and the digital age legacy of military investment in remote communications. Most major industrial firms of the modern age were intricately involved as military suppliers or were privatised former military organisations. Many modern cities only exist because of the strategic benefits of their local military bases, while public major works such as highway and rail systems, ports and airports, were products of military strategy more than peaceful economic investment. And, surprisingly to me, the cooperative legacy of previous wars is not simply technological, but also institutional; from the organisational structures of firms, to the welfare state, to international treaties on money and trade. The employer-worker relationship looks a lot like the soldier-army relationship, requiring induction, uniforms, codes of conduct, and hierarchal rule. Modern provisions of the welfare state, including housing, health services and cash payments, were often originally created for returned soldiers following wars. It is no leap to suggest that our international monetary system, and the various international organisations and treaties that accompany it, is the direct result of resolutions in the shadow of the WWII. And perhaps the apparent breakdown of the social equality nurtured by post-war institutions observed since the late 1970s in many western countries is merely there result of the absence of external threats which breed infighting and abuses of power. As you can see, “Ultrasociety” will leave you pondering many big questions you may never have thought to ask before. I certainly see the world differently now. And that, to me, is the sign of a profound and insightful work. This entry was posted in Human Nature and tagged War. Bookmark the permalink. Is This the Future of Economics?